It can be difficult to start flying again after not having flown at all for several months. That was the case for me when I came back to school in the fall. 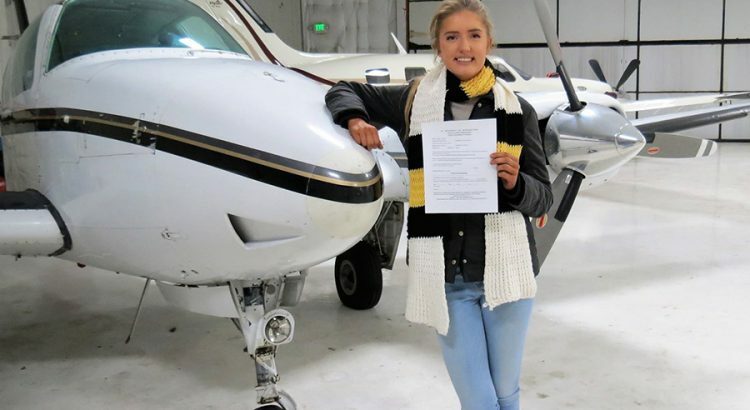 I am a senior at Valparaiso University – a school in northwest Indiana – with a major in English and a minor in Aviation. My flight training started last year, my junior year, with getting my private license in the fall and my instrument rating in the spring. After that, I took a few months off from flying over the summer so I could work and save money. That meant coming back in the fall to start my commercial training was a little intimidating, especially when I realized I was expected to start doing a bunch of solo flights. I had not flown solo since my private pilot training the year before, and even then I had been quite nervous. I remember for my long solo cross country going up along Lake Michigan to an airport in Michigan called South Haven, my radio communications shaky as I asked for flight following. I remember being hyper-aware of how far out over the lake I was flying from the shoreline just in case I had an engine failure and needed to glide to dry land. All the worst case scenarios were running through my head, my hands were sweaty, my head hurt, ATC was impatient with my poor-quality radio calls, and I was not having a good time. I felt those same feelings on my first flight back this fall. I thought I had forgotten everything I had learned about flying over the summer and that I wouldn’t even know how to start the plane. Luckily, I got my flight instructor to go with me on my first flight which was probably a smart move in case I really had forgotten anything important, but she did not seem to understand my anxieties. She told me that I was her easy flight of the day since I’d be doing all the flying and she was just along for the ride. The burden of the responsibility of acting PIC on that flight bore down on me like a heavy weight. I thought that my CFI just expected me to know everything without any help. Grimly, I got in the plane and buckled in, afraid that I was going to royally screw up something important and that I would disappoint her. We took off, got in the air, and sat. And sat. And sat. I started to realize why I was her easy flight of the day. We just sat and talked as there was not much to do in between airports. Sure I used the time to ask questions and familiarize myself with the plane again, but there wasn’t much to do besides that. We landed at two towered airports on a clear, calm day and came back, no hassle. I felt really silly that I had been so scared about that flight. 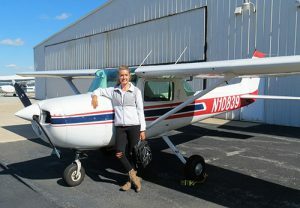 I gained a lot of confidence in my abilities after that, and my first solo flight in commercial training was a breeze. I quickly started wanting to challenge myself, using VOR navigation rather than GPS, giving PIREPs, and utilizing FSS’s for things other than just weather briefings. One particularly memorable solo flight that taught me a lot was down to Owensboro, KY. It was about a 450nm trip, so I knew I was going to need to stop somewhere for fuel along the way. Using Foreflight’s map of fueling prices, I saw that fuel would be cheapest in Tell City, so I landed there. Tell City was a very small airport in the middle of nowhere with horses and cows grazing near the runway. There was no one at the airport, which made me nervous because I had no clue how to use the self-serve fueling station. Also, I needed to use the restroom and I had no idea where to find one. Luckily, upon inspecting some of the buildings at the FBO, I found one that opened using a pass code that had bathrooms, vending machines, and a lounge area. I now know that lots of small airports have FBOs that are accessible to pilots 24/7 which is really handy, especially if you’re on a long cross country trip. The plot thickened once I got back to the plane and tried starting it. It wouldn’t start for the life of me! I was priming and cranking and priming and cranking and the engine wouldn’t kick over. It dawned on me that I was over 200 miles from home, and if I couldn’t get the plane to start, I wouldn’t be getting back anytime soon. Trying to stay calm, I did what any good millennial would do; I whipped out my phone and googled why the plane wouldn’t start in order to troubleshoot the issue by myself before calling my flight instructor for help. I took the first suggestion that popped up which said that the engine may be over-primed and therefore flooded. It said to crank the magnetos without priming until the excess fuel burned out of the engine. I did it and it worked! My heart flooded with relief as the engine finally kicked on. From there I figured out how to do the self-serve fueling rig and went on my merry way. Since then I’ve had many more flights where things haven’t exactly gone smoothly, but I’ve learned a lot from my mistakes, and every flight has given me more and more confidence in my abilities. I’m only about a quarter of the way through my commercial training, and I’m excited to keep growing and learning new things as a pilot.